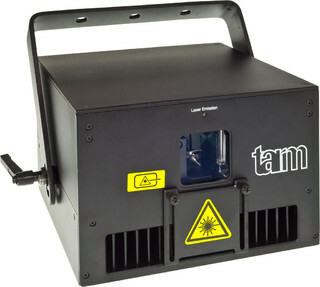 The tarm 2.5 laser has great beam specifications with a diameter of ca. 3.5 mm and a beam divergence of less than 1.0 mrad (full angle). The tarm 2.5 FB4 show laser has an integrated Pangolin FB4 interface. The Pangolin FB4 is a network interface, which runs with Pangolin Quickshow or Pangolin BEYOND software (available as separate upgrade license). Pangolin Quickshow is already included. There is no need anymore to using ILDA cables to connect the show laser to the control computer. The Pangolin FB4 &apos;Max&apos; runs the Pangolin Quickshow laser control software and offers the possibility to control the show laser system through TCP/IP network, DMX512 control or by the onboard SD-memory. Just connect a network cable (CAT5) from your computer, running Pangolin Quickshow (free software download on pangolin.com), to the network port of the Pangolin FB4. Just connect a DMX512 cable (XLR 5pin) from your DMX console or DMX interface to the DMX IN connector of the Pangolin FB4. Create content in Pangolin software and then export this content to the onboard SD-memory (included in delivery). It is possible to playback the content from the SD-memory automatically, without the need for a computer. The tarm 2.5 FB4 is especially suitable for show laser applications in clubs and bars and can be used by beginners as well as professionals.